Welcome to Peoples Anonymous. Herein lies one of the most profound spiritual healing recipes ever entrusted to the human race. This Twelve-Step technology has the capacity to heal your life beyond anything you may have previously imagined. Millions are currently living happy, joyous, and free by simply applying this program to their daily lives. We consider the twelve-step recipe outlined in this book to be the spiritual alchemy of the 21st Century. It transforms the lives of those who are willing to follow the directions precisely into gold. 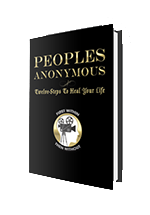 Peoples Anonymous proposes that anyone can significantly improve the quality of his or her life by applying the spiritual principles of the Twelve-Step Recovery Program originally given to the world by Alcoholics Anonymous in 1935. You need not be an alcoholic or an addict to experience a powerful spiritual awakening. With this recipe for healing, radical transformation is now within your reach, no matter your current challenges or what point you’re starting from. Many of us in the human race suffer from some form of our own internal spiritual malady, such as always feeling apart from, “different” or simply never good enough. This feature of the human experience can show up as a lack of self-confidence, a sense of depression, anxiety, or merely being restless, irritable, and discontented. ~Dr. Bruce F. Singer, Psy.D. If you need help with an alcohol problem, please visit Alcoholics Anonymous.